It may sound silly to a seasoned coupon user, but this is actually a subject that I was hesitant on until the last few months. My brain just couldn't accept that this was completely legal and fair - one of those too goo to be true type deals. But I am here to tell you, it is completely fair and stores encourage it! So here we go. Think back to the last time you went into a store all excited about a sale they were having only to find that they didn't have any more of what you wanted. It's incredibly frustrating! And the longer you coupon, the more you will come across this issue because you are always shopping for the items with the best price - which always sell out first. 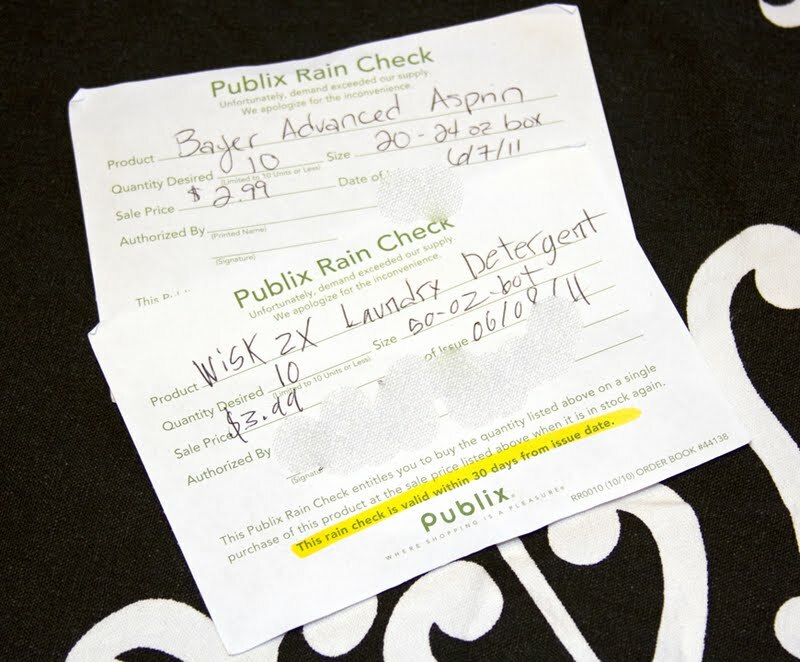 So, since running out of sale items is an inevitability, most stores have a little piece of paper to try to restore your faith in their establishment: The Rain Check. In a nutshell, a 'rain check' is a piece of paper guaranteeing you the same sale price you would have gotten had the item been in stock on the day you intended to purchase it. How great is that? Granted this doesn't always apply to every item and every deal (which I will explain shortly), but in general a rain check is a great way to still get the best deal when you can't find the item. How do you get a rain check? Obtaining this magical piece of paper is different for each store, but usually it consists of going to customer service and asking for one. At Publix, I love getting rain checks. They are always more than willing to give me one for any item that's on sale and usually they already know when an item is out of stock. Sometimes, they will call someone to check the stock in the back room first, but if they don't have any or don't have as many as you want, they will always issue you a rain check. At Target, if they already know that an item is out of stock, they will actually put a little peelie pad full of "rain check" forms where the item would be. You then have to take that check to a cashier and they will print out an actual rain check for you. At Target, they sometimes have to check the add before giving you a check to make sure that it is not listed as "while supplies last", but more often than not they are happy to issue you a rain check. Like I said, every store is different, so if you are curious about a certain stores policy on rain checks, just call up their customer service department. How long are rain checks good for? This is another issue that varies from store to store. 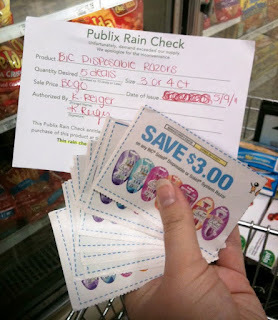 At Publix, the rain checks are good for 30 days and at Target they are good for (I think) 60 days or so. Your rain check should clearly state how long the check is good for and if you have any questions, just ask the customer service desk. How do you use a rain check? Ok, so now that you have your rain check, how do you transform it into savings? Well, technically you can just walk up to a cashier with your items and tell them "I have a rain check" before they start ringing you up and hand it to them. Most rain checks will have a bar code to scan or a number to put into the store's system to access that price. If I am ever unsure about anything with my rain checks, I just get my items and go to customer service to ask first. If there are any potential problems that could arise that would need manager approval or something like that, the customer service rep can let you know and they will usually offer to ring it up for you at the customer service desk. The only gray area I have ever encountered is if an item has been consistently out of stock for longer than the rain check is valid. I have only had this happen once and luckily, it was at Publix. In this particular case, Publix had the 3 and 4 packs of Bic Disposable Razors on sale $5.49 B1G1 free. Also, there was a $3 off Any Bic Disposables coupon in the newspaper that same week, so when you bought 2 razors and used 2 coupons, you would have an overage of 51¢ applied to the rest of your bill. Naturally, this was a very popular item, so they were out of stock on May 4th when I went in to purchase them - so they gave me a rain check. It actually turned out that all Publix stores nationwide ran out of these to the point that their warehouse was completely out of stock and they were waiting on more product from the manufacturer, so no matter how many times I checked, they were never in stock. It wasn't until my trip last week on June 9th that my store finally had them. So, I grabbed my razors and went by the customer service desk before making the actual purchase to see what I needed to do. Due to the fact that the store never had this item in stock during the 30 days my rain check would have been valid, they were happy to honor it for me. In order to do that, the customer service rep actually just wrote me a new rain check with a new date of May 9th on it, so it looked fine for the cashiers as June 9th would have been the last eligible day for my to use it. Then I just went in the checkout line with the rest of my items and the cashier rang everything up just hunky dory. I was even able to use my coupons (which actually expired on June 12! ), which was very lucky. I have had it happen that my coupons expired before the item is restocked, but that is just the way it works every now and then. Sometimes you win, sometimes you lose, but at least the store was willing to issue me a rain check for the possibility of the item being there in time. How do you know when an item is eligible for a rain check? There is never an exact science about rain checks. There are some times when a rain check is definitely not a possibility - when the item is part of a "door buster" sale or if the ad says "while supplies last". These are prices that can only be locked in if you find the item and purchase it at the date and time specified by the sale and the managers will probably be pretty aggrivated if you ask for a rain check (mostly because 50 people before you have probably already asked for one). Make sure you read your sale ads very well before asking for a rain check just to be sure. Once you are positive the store hasn't put any stipulation on the item, go and ask for your rain check. I have had it happen that instead of issuing rain checks, the store tries to offer a comparable product at that items' sale price, but usually you can choose which option you want to use. I hope that this has been somewhat informative. Like I said, I know to some this will be old news, but if you are not used to the idea of freezing your sale prices, you don't know what you're missing! Make sure you ask for a rain check next time an item is out of stock!